Moscow, Constantinople (now Istanbul), and Rome itself are vitally alive in the present and are magnets for tourists. Also going back a long way, each lives in history. These cities have their points in common, each wanting to rule the world and establish Rome of the Caesars, Constantinople of the Emperors, and Moscow of the Tsars were also the Rome of St. Peter, the Constantinople of the Patriarchs, and the Moscow of the Orthodox Metropolitans. These were cities on earth that aspired to heaven, kingdoms that succeeded each other as standard-bearers of Christianity from the fourth century on. Indeed, the Russian monk declared to the Tsar: "Two Romes have fallen, but the third stands, and a fourth shall never besh the kingdom of heaven on earth. People, recognizing this, link them together as the Three Romes. These cities differ, though, in their understanding of man's nature and business. The Three Romes are three places and also states of mind. Now, with a new introduction which describes the contemporary significance to these cities this book will be assessable to the modern reader at all levels.This fascinating book weaves the past and present in a narrative that is sometimes harrowing, always vivid, and even, at times, amusing. Russell Fraser shows the reader each city as he himself saw it. He shuttles easily between today and yesterday, between today's Central Committee and Ivan the Great, between Turkish Istanbul and the golden Constantinople of Justinian, between today's Roman politics and the splendid Caesars. Great historical events, intellectual concerns, and artistic riches define the three Romes. Fraser goes beyond the facades, images, and myths to lay bare the three great psychologies still vying for the mind of man. 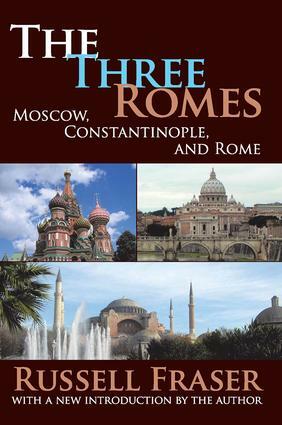 The Three Romes is an utterly original book�a celebration of the past and an urbane guide to the present.